Summer is officially upon us, and record heat waves are already taking hold. A recently released study anticipates that by 2100, 75% of humanity will face the threat of dying from heat unless carbon emissions plummet. There is something we can all do! This summer, when conversation (inevitably) turns to weather, heat waves, forest fires, and hurricanes, tell everyone about the passive house concept. Mention that it's a proven way to reduce global carbon emissions by 40% or more, provide healthy living space, and secure future energy savings. It's storm resilient, beefs up power grids, and is more affordable than building-as-usual in the long run. People are understandably worried about the US federal government's position on climate change. Let them know that we are all global citizens as well as local ones, and that there's a larger movement going on that they can be a part of: Passive House is a global standard, with global collaboration, and will soon become a key part of the international agreed pathway to rolling back climate change. It's a way to focus on a hopeful future for everyone by everyone. Tell people. Tell everyone. Talk to your families, friends, coworkers, representatives, people on the bus. Tell them there IS a better way to move forward. Tell them it's cost effective, will save them money, that they can be energy independent. Make sure that everyone you know, knows the answer to "How can I help turn around climate change?" - Passive House, of course! It's just a better way. Developed by the HANDS ON WORKSHOP series partners: City of Vancouver, RDH Building Sciences, and Small Planet Supply, this all day workshop is designed to help builders meet the Vancouver airtightness requiqement of 3.5 ACH50 for Part 9 (SFR) buildings. This is an all day "hands on" workshop. FXFOWLE Architects' new case study for Passive House tall residential buildings is detailed and convincing case that Passive House offers the following benefits for a typical NYC high-rise residential building: 85% reduction in heating energy and 47% reduction in primary energy. With only 2.4% capital cost increase, the additional investment would be paid back in 24 year with a net present value $5.2M in savings over a 40 year life. If you missed the Spring conference, you missed some excitement! We were very pleased to announce the launch of the PHnw Building Directory, which is now live! Please give architect and Passive House designer Benjamin Wolk-Weiss of Zoetic Architecture a word of thanks. Over the last year, Benjamin proposed, supported, and obtained an amendment to the Oregon residential building code that will save Passive House homebuilders in Oregon considerable time, money, and effort. 2017 New Gravity Housing Conference: Climate Change and the Imperative of High Performance Affordable Housing. The reality of climate change will fundamentally alter the way buildings are designed, built and operated in the coming decades. Building healthy, safe, and accessible places to live that will both limit and adapt to climate impacts is a key challenge for the 21st Century. 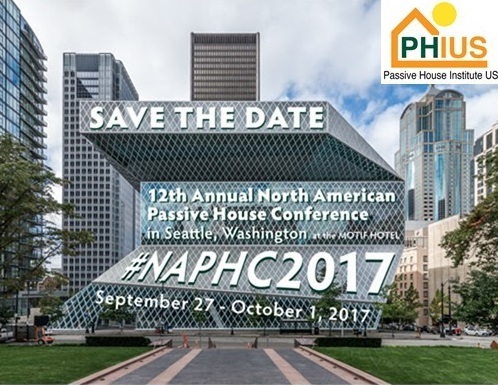 This two-day conference will explore the tools, techniques, and practices that the building community is using to address this challenge, focusing on multi-family Passive House and Net-Zero-Energy capable strategies in affordable housing. We received over 40 proposals for lectures from developers, architects, engineers, builders, and policy experts from around the country and will be releasing a preliminary schedule for the conference in the coming days. Confirmed Keynote lectures by Jonathan Rose (NYC), Zack Semke (Seattle), Lois Arena (NYC) and Sebastian Moreno-Vacca (Brussels) will raise a diverse and relevant set of issues meant to highlight the opportunity for HOUSING to address these most pressing challenges for our generation. CORE CONFERENCE REGISTRATION IS OPEN! Register now for the Core Conference (Sept 29-30) at our discounted early bird rate! Only available through July 17! PHAUS Professional Level Members receive an extra 20% discount! Pre-Conference and Passive Projects Tour registration opening soon! Exhibitor & Sponsor info, extracurricular event schedule and more will be available soon. Most events to be held at the official NAPHC2017 Hotel: The MOTIF in downtown Seattle. Reserve a room today in the discounted PHIUS Conference room-block. If you submitted an abstract, please check your in-box for your acceptance status! RSVP is required to reserve your presentation slot. Email [email protected] if you have any questions. Building Simulation 2017 unites worldwide practitioners and researchers to share insights and info on the state of the art in simulation tools, applications, and new developments. Our WUFI sessions will cover energy simulation, airflow and natural ventilation, thermal comfort, lighting and daylighting, acoustics, and more. There's a Passive House revolution underway. It might not be obvious to all of us working in the trenches to get one more ultra energy-efficient project built, one more sustainable building policy in place. But taking a step back, we can see evidence of a market in rapid transition, showing some of the tell-tale signs of a technology leaping from niche towards mainstream.